After a chilled-out morning in Fiesole we decided to run with this theme in the afternoon and had more chill out time in the Boboli Gardens. One last oasis of calm before one last evening soaking up the hustle and bustle of Florence. Just as we paid the entrance fee the sky turned black and the thunder started to rattle – probably not the best time for a garden visit but having paid we had to persevere. 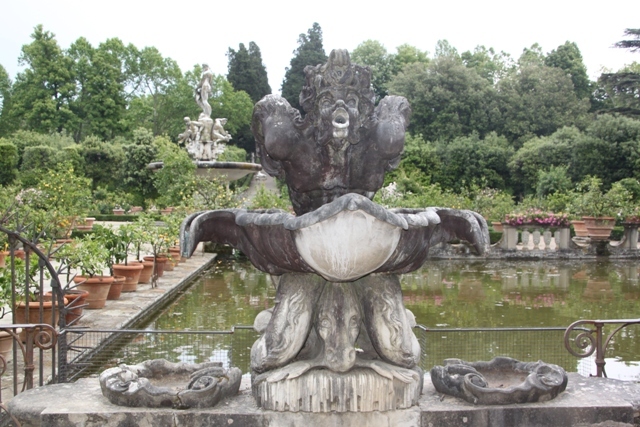 The Boboli Gardens are a Medici creation – this was supposed to be an outdoor museum dotted with Roman antiquities and sculptures. It shows Renaissance art is not all about formal pictures. 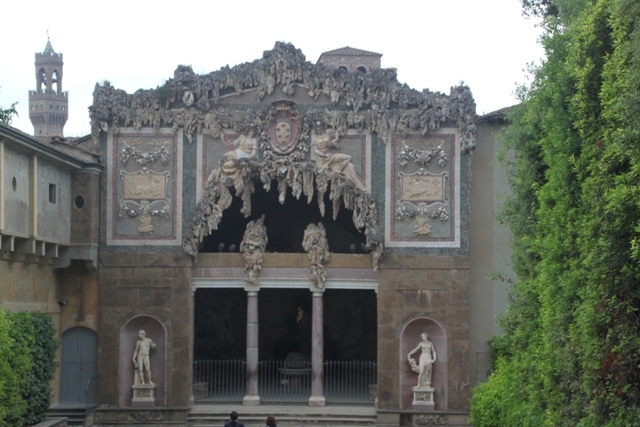 A Florentine banker built the Pitti Palace but sold it to the Medici family in the sixteenth century – from then on they expanded the palace and gardens in a display of extravagance at its best. 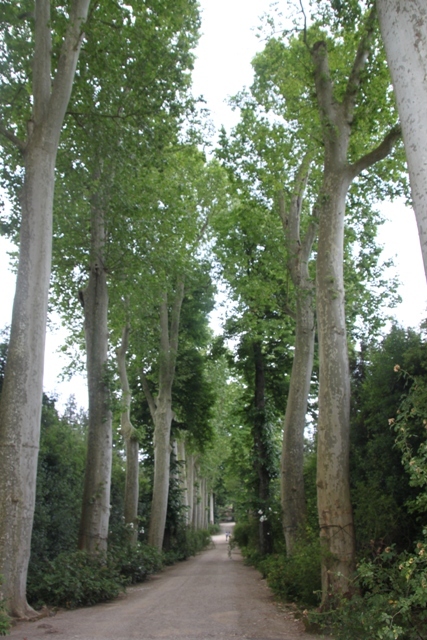 We found grand paths, formal gardens with grottoes and fountains and the whole place was a bit like a huge maze – paths lined with trees that meet in the middle. No end of benches and green spots to sit down plus stacks of space for kids to run around and let off steam. 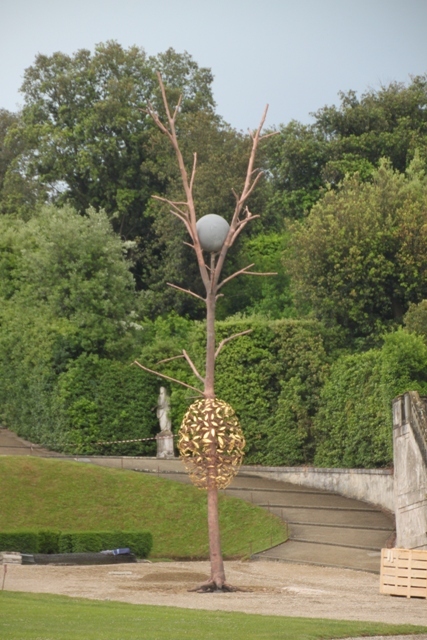 Lemon trees aplenty with sculptures here and there Son, not normally too much of a garden fan, found it a great place to explore. 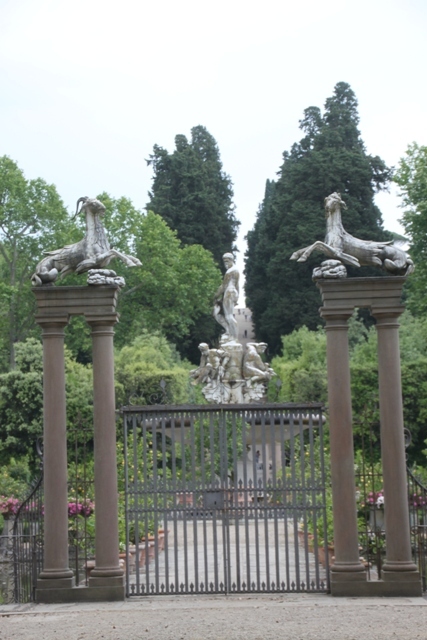 When the thunderstorm really got going we were by a stroke of luck close to a museum in the Pitti Palace – our garden tickets allowed us entrance to this one museum. Had the weather been fine we might have skipped this – the pounding rain did us a big favour. The exhibition was all about fashion through the ages – lots of costumes, dresses and I found it right up my street. Husband and Son were far less enamoured but humoured me. Right at the end was the burial costumes of Cosimo di Medici, his wife and their 13 year old son. These have been exhumed and using intricate preservation techniques restored and put on display. It was completely fascinating. The rain was still going strong when we finished in the museum, we tried to linger a while longer indoors but after drinks in the (extremely overpriced) cafe the weather improved enough to be outdoors again. A bit more strolling, a bit more exploring and we found the Grotto Grande – a bit of a creepy cave decorated with overhanging stalactites and full of dark, gloomy passageways. 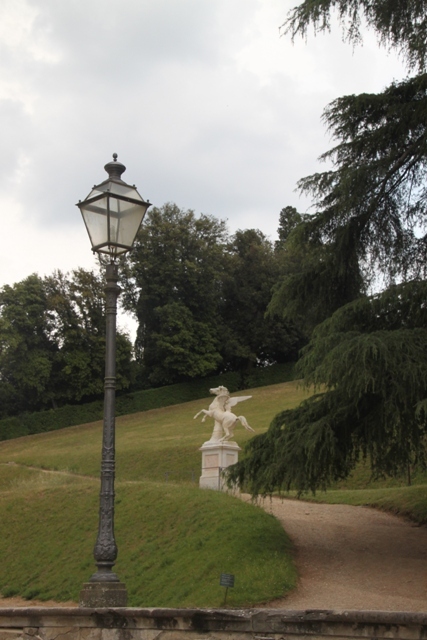 We stayed in the Boboli Gardens until closing time, just walking and following our noses and loving this expanse of fountains and paths – not to mention an epic view of the city. It was a lovely afternoon – thanks for visiting with me!! Your photos of Boboli are much more interesting than mine. Lovely! 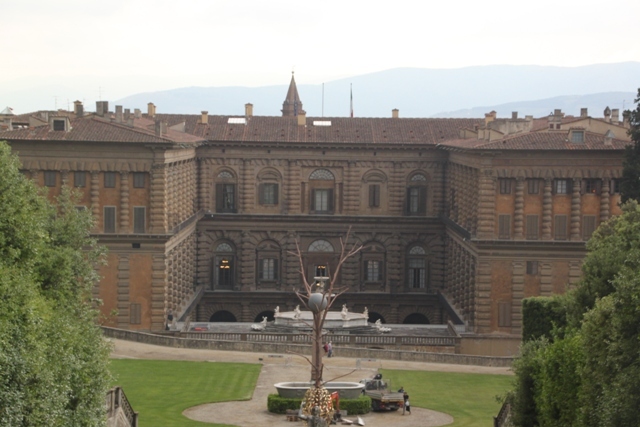 For all the Medici money, I thought Boboli would be more like Versailles, but it was very enjoyable, nevertheless. 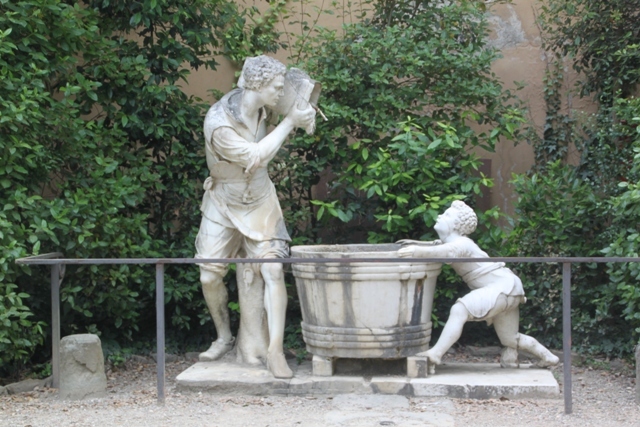 The first time I went to Boboli I remember being not at all impressed. This time around we loved it – not sure what changed, maybe my expectations!! Never been to Versailles (unfortunately) but it’s definitely on the list – it looks absolutely stunning. Nice to be taken on a mini vacation through your photos this morning. Love that gloomy lion! Thank you Melissa! I’m partial to that lion too!! What a garden! Really worthwhile visiting! I am glad for you you also checked out the museum. Due to the weather you had it all! Sometimes a thunderstorm can do you a big favour Erika!! It was a great afternoon and I’m glad the weather forced us inside, well worth it. This looks massive. I would have loved the costumes as well. And Z would love the running around. 🙂 I really want to go to Italy now… so badly! Anything with dresses and costumes always gets my vote – travelling with 2 boys I don’t always get the fashion fix I crave so this was great. The running around opportunities were awesome too. We almost didn’t make it inside – have the rain to thank for that!! We enjoyed the museum but I think the gardens have the edge! Thank you!! Hope some of it might be useful when you are there. You must be getting excited about the trip now! Those gardens look fantastic. 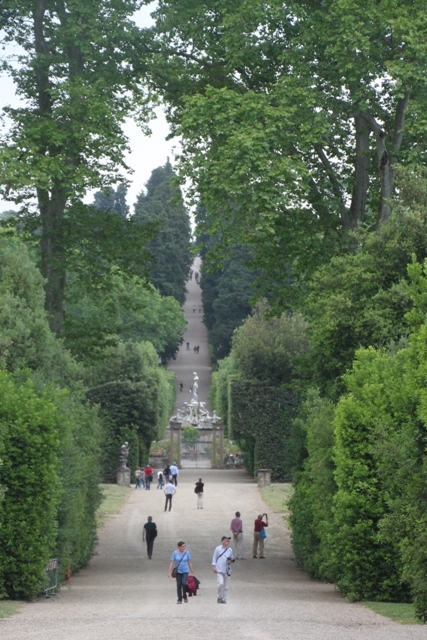 My kids actually quite enjoy formal gardens because of all the pathways to explore and the sculptures to chance across. They loved Chatsworth and Wilton, for instance. They are, however, a bit impatient with my photography in gardens. That storm was definitely serendipitous. I am very intrigued by the burial costumes in particular, perhaps because I am a tad macabre. The burial costumes were so fascinating – the story behind the family and how they exhumed and preserved the burial shrouds was incredible, one of the most interesting exhibits I’ve seen in a long time. The fact it was unexpected too made it even more of a gem. I know what you mean about the garden/photography issue – I get many an impatient comment too! 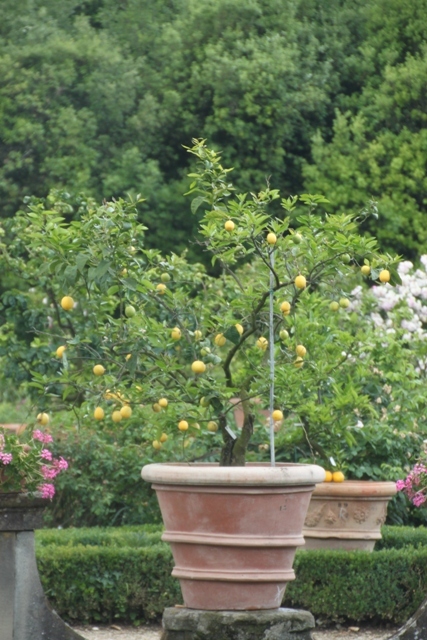 It was gorgeous – most of all those lemon trees though, something about seeing lemons growing that I just love! It wasn’t the best weather and a bit gloomy but we still had a nice time there. Never been to Versailles – unfortunately!! – but it was lovely here and definitely a welcome respite from the crowded streets of the city. 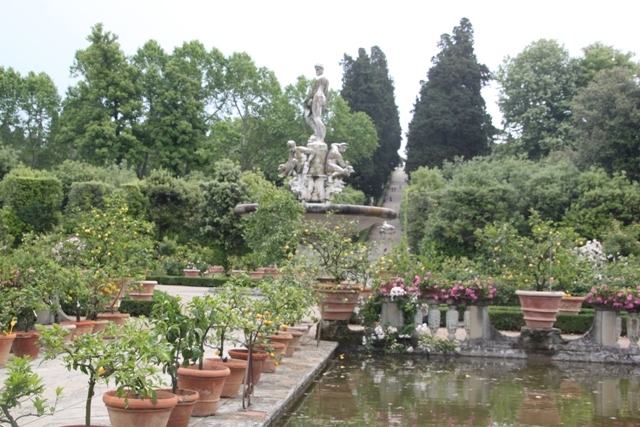 It was a peaceful oasis in the middle of hectic Florence! We had a lovely afternoon there Rosemary, despite the rain!! In fact I was glad of the bad weather because it meant that exhibition – so good and so interesting, and sometimes a lady needs to be humoured!! I always “like” your posts but really I love them… Thank you for sharing! It feels like our family is travelling with yours, which is so much fun! Thank you so much for your kind comments and thank you so much for “coming along” on our trips! 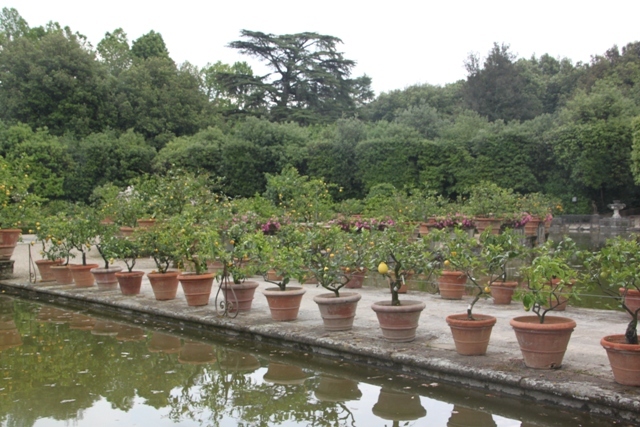 Wow, those Italian gardens are something!! They’re gorgeous and a great place to escape all the hustle and bustle of the city. Thanks Joy, beautiful pictures and descriptions helps me plan our next family trip. It’s a beautiful city but these gardens are a little bit of calm in the midst of all the hustle and bustle! It has been few years since I listened to stories about Bobobli gardens on our lectures of garden architecture. It was nice to see them again on your photos. Thank you for the few minutes in green peace. Thank you Barbara for dropping by here! 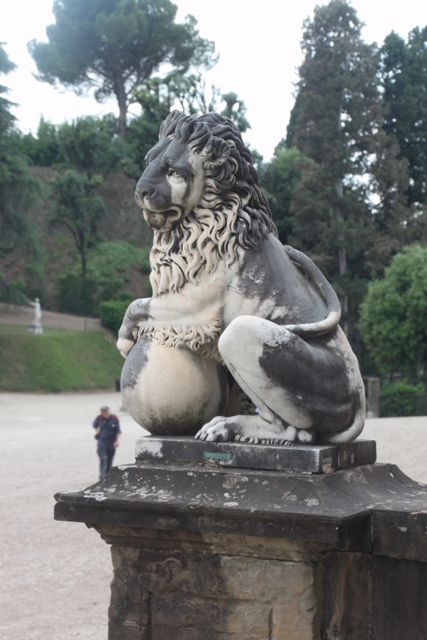 Loved the Boboli Gardens – such a beautiful place to escape the hustle and bustle of the city. Love the photos! 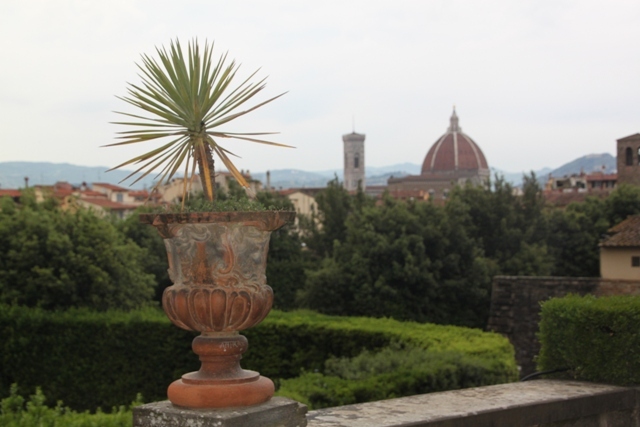 We recently visited Florence but did not have a chance to visit the Gardens – damn! Now I wish we did! The trouble is there’s so much to see and do in Florence, tricky to fit everything in. Maybe next time….